According to a recent article in the New York Times, in the UK, which still doesn’t have a no-fault divorce law, causes for divorce might have hit a new low! According to the article, a woman sued for divorce because her husband insisted she dress in a Klingon costume and speak to him in Klingon –perhaps she was not a Star Trek fan. He defended by declaring that the wife had maliciously and repeatedly served him his least favorite dish, tuna casserole! One doesn’t want to take the fun out of it, but this case should definitely have been mediated. Think of all the time and money spent on going to court with an endless litany of wrongs, large and small, depending on your tolerance for tuna casserole and/or usurping your spouse’s control over the TV remote, in order to get a separation and divorce. 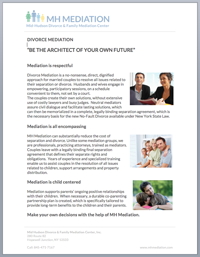 The more expedient and cost effective use of mediation would make divorce so much more easily completed. In mediation there is also time to “vent” if the parties need to do so. But do read the article, if there is anything humorous about the divorce process, you can find it here. After you’ve read it, you’ll be glad you live in America and that mediation is becoming so popular!